The Robo-Quip optimizes all the advanced features in a clean, simple design. It is uncomplicated and does not utilize expensive PC boards or other parts found in competitive brands. All the while, offering the same advanced features such as Ethernet and DeviceNet capabilities. The Robo-Quip incorporates a self-adjusting nozzle clamping assembly. There is NO V-BLOCK and NO NEED to readjust when switching from one size OD nozzle to another. The precision 4-point systems allows for exact alignment of the nozzle to the cutter blade every time. All electrical and pneumatic lines are contained inside the unit offering protection from physical and UV damage. Easily monitor the required air supply to the reamer. 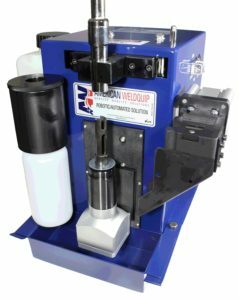 The special SETUP switch allows for fast, easy setup by allowing positioning of the robot and nozzle over the reamer blade for an uncomplicated setup procedure. The use of a completely modular valve terminal offers compact and easy serviceability. The manifold system offers extremely high flow rates and is easy to service if required. Quick access at rear of the unit for fast repair or maintenance. All “quick disconnect” pneumatic air lines are color coded to their specific operation for easier identification and service. The Robo-Quip is supplied standard with a debris tray to capture nozzle spatter. In addition, the enclosed anti-spatter spray chamber helps to contain any over spray and capture any excess in a bottle for easy disposal. Hold 50% more anti-spatter solution with the 1 ½ quart reservoir. Supplied as standard is a TCP pointer. Functional test buttons for spray and reamer operation allow fast testing of components. The Robo-Quip wire cutter easily cuts a variety of wire types and sizes. It is the perfect option for the Robo-Quip to cut the ball of the end of the wire.